SAY : NO TO NO, Don’t linger others. But, how to say NO ? Biologically, the sudden rush of the adrenaline chemical in our blood stream from our gland, stim ulates the jerking strength to fight or act physically. Therefore, while discussing do not stand, sit a while. In sitting disposition, the adrenaline chemical is attenuated. So, Take a minute to approach for discussion. Some people joke all the time, carefree and can be teased. BUT some people are serious or sensitive to teasing and get easily offended. Avoid: smutty jokes, rude jokes, “sick” jokes about dead cats, sexual innuendos, toilet humor, teasing unless you are sure the person can take it or take a prior consent! Different nationalities have different types of humor. Not everyone finds the same things funny. 1. OLAFA System: It is OBSERVE, LISTEN, ASK, FEEDBACK AND AGREE. How should you give FEEDBACK and approach AGREE situation? It should be followed in stated order. However, we cannot always expect that you must somehow come to AGREE situation, we can always just try our best approach in discussion with opponent by SANDWICH Method and Diplomatic Approaches understanding the SITUATION Analysis. a.SOFT PART: Don’t incite anger or displease with your vile, contemptible beginning with distressed people. So, Instigate conversation by deflating him/her with Empathy, Sympathy, Condolence, Appraise of his/her good deeds in pasts, on the situation stated by haughty, overweening and insolent person. You can request him to “sit” and give a cold drink first. You can start with following story telling. I honestly understand the situation that you had been into……. I am very sorry to hear it…………………..
Last year, I had also been through to similar situation……. b.HARD PART: Slowly enter into expositing hard facts in order to make him to elucidate other side. In some instance, you could staunch with spearheading truth with reflection of what had happened and Negotiate it with win-win and persuasion. Sometimes, it could also might have happened that…………. We also have to understand that ………………. (say that other side is also very strong perspective in order to make him/her realize that he/she is wrong). Note: Say “NO” to “NO”, BUT BE SURE YOUR “NO” IS LOGICALLY SOUND WITH GOOD PURPOSE AND DOESN’T HARM ANYONE. c. SOFT PART: Try to collaborate, Conclude with Constructive suggestions, forgive or forget cold past things and offer a room to improve with soft tone. Inspire or use motivation, encourage them to persuade- don’t just tell them what to do. Still, We can go together and solve this problem by…………………. So, We can consider it together by…………………. For Project Meeting dealing with Donors to convince, the following is the good steps you can start with. Our proposal deals with the serious problem of………. This problem really needs more attention because………. The following shows that our approach is very effective…..
We are unique organization because……. If the proposed project wouldn’t be implemented…………..
3. DIPLOMATIC APPROACH: Use positive diplomatic techniques, some approaches as follows. WORDS – Use powerful short, effective positive words. Speak for ordinary public people, so use sometimes amusing, everyday words like you talk to your friends. Donald Trump won the Dec 2016 US election because of his simplicity in words and talk. Even in a public, talk as if you are talking with a single person becoz every single only listens to you, but why do u think u talking to many people. It removes fear of public speaking. PERSONALITY – Your personality adds value, power, give weigh to words you pitch. a. Autocratic: You give orders, or take a lead with your words and actions to make a decision. It is a risk too. I Strongly recommend ………. I would like to……………………..
b. Democratic: You allow others also to influence in decision making. As far as possible, accept democratic approach with negotiation. AVOIDANCE- Like the way, there’s always a moment of happiness, a black clouded moment also shroud us. During this time, AVOIDANCE is also a first step, no matter what your opponents say. However, later when his head cools off, you should go to discuss on matters with him/her by following above aforementioned steps 1,2,3. 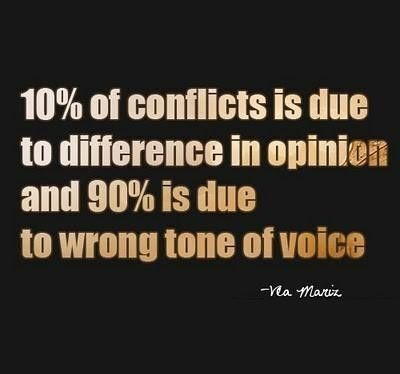 Good communicators don’t formulate their responses to another person while he or she is still speaking. When we do that, we can’t be fully tuned into what that other person is saying since our mind is already elsewhere: on ourselves. So, Good communicators actively listen to others first, think through their response second, and speak third. 2. Take a Deep Breathe- Oxygen is very important to Brain. Before your speech, take a look around to audience first, look up the auditorium hall, it is a psychological introduction and preparedness for your confidence. Start Positive way like by thanking for such opportunities and all audiences, audiences is here to listen what you have to say on topics, issues that is relate yourself to them directly or indirectly because Empathy is what all requires. 4.Determine your results: Are you seeking a concrete solution to a problem you talk about? Are you simply wanting to share something interesting or exciting? Or do you just need to vent your frustrations a bit and feel heard and validated? Type 1. Brevity: For example, U might be the type of person who likes to get right to the point in as few words as possible. No chit chat, no small talk, just dive right into the facts. This is the “Land the Plane” style of communication. It is explained with 15-20 words concise and precisely of what Results, Effects, Achievements, Gain (%), True/False, Yes/No. Leaders and Boss only like to hear such. Always Remember, it is good for Interview in face to face. Type 2: Explanation: U might be the opposite (appropriately called the “Enjoy the Ride” style), preferring to share your feelings, tell stories with lots of colorful details, and lead up to your main point with plenty of background information. It usually follows with WH questions: What, When, Where, Which, Whom, How. It is an explanation of affects in a work process from beginning to end. Always Remember, it is good for E-mail responding. But, I prefer Type 3: It is more Type 1 and Less Type 2 combination because Leaders, Boss are experienced and talent who need brevity with explanation. If they ask Wh questions, then, Type 2 is very important. A person with few words. Lessons: Now on wards, you can easily identify what Type of People in communication world BEFORE YOU SPEAK. Achievers do not complain about barriers or hurdles; instead they find a way around obstacles and use their creativity to challenge them. Remove “I could have”, “I should have”, “I want to”, “I might have been able to”; Instead use, “I HAVE TO ……..by definitive time bound”.These negative elements do nothing but slow you down in your journey to achieve success. Instead of insulting a person, the job or the company, they seek to resolve issue with proper Facts, Tactics and complete Neutrality. During my previous organization i worked towards the goal and mission sincerely for 8 years, which i hope to give it to you as a coordinator. I have worked patiently and persistently with my office colleagues, staffs, village community and our international partners in person and in other means. During the progress of the project period, as a field staff too, i have been encountered many different, difficult situations which is obvious, and such experience will be very helpful when i joined your prestigious organization. Other than my job, i am a blog writer, play music, draw art, calligraphy works, write a book, scientific researcher.